Frank Lloyd Wright is widely recognized as the greatest American architect of all time. Although only one of his buildings in Canada still stands today (a cottage near Sault Ste Marie, Ontario), Wright’s influence is still evident in the designs of single-family homes and new residential projects throughout the province. There is often one in the crowd—that solitary dwelling that looks totally different from anything else on the block. The appearance is distinctive: a low-to-the-ground building profile, a flat or gradually-sloped roof with generous overhangs, sweeping horizontal lines, panoramic floor-to-ceiling windows, and natural stone and wood inside and out. The design is clean, linear and contemporary. It is difficult to imagine that the style, often referred to today as Craftsman, was conceived by American architect, interior designer and educator Frank Lloyd Wright more than a century ago. Wright was one of the originators of the Prairie School movement of architecture, an outgrowth of the American Craftsman movement and its philosophy for quality middle-class home design. His “Prairie houses” were low buildings with shallow, sloping roofs, clean skylines, overhangs and terraces, incorporating natural, unfinished materials. Wright also conceived a new type of residence known as the Usonian House. Designed as practical homes for middle-class folk, these homes featured small kitchens, adjoining dining spaces and bedrooms and large living spaces with fireplaces fitted with built-in seating and tables to encourage family gatherings. Wright’s Usonian House designs later influenced new-home building in suburban developments, including open plans, slab-on-grade foundations and simpler construction techniques. During his long and illustrious career, Wright designed more than 1,000 buildings (532 of which were completed), including homes, offices, churches, schools, skyscrapers, hotels and museums. Unique in their time, Wright’s designs were innovative and original in a world of architectural revival of older, classical styles and stood in stark contrast to the industrial “machine for living” home designs of his contemporary, Swiss architect Charles-Édouard Jeanneret-Gris, better known as Le Corbusier. As an extension of his architectural skills, Wright penned 20 books and numerous articles, lectured throughout the U.S. and Europe and designed many of the interior elements of his buildings, such as furniture and elaborate stained glass. Referring to his style as organic architecture, Wright created buildings that were first and foremost in harmony with people and the environment. His goal was to design structures that brought the outside in, using large windows, natural stone and wood on the exteriors and interiors. Widely recognized as a masterpiece of home design, Wright’s Fallingwater was commissioned as a private retreat by the Kaufmann family of Pittsburgh, and completed in 1937. Nestled amid nature in southwestern Pennsylvania, the spectacular house is positioned over a natural stream on top of a 30-foot waterfall, its contours echoing the patterns of the location’s natural rock ledges. As if defying gravity, Fallingwater is held in place over the falls by a series of cantilevered concrete trays anchored to a massive central stone chimney. Strong horizontal lines and low ceilings help to create a sheltered and safe environment. To bring nature into the home (and encourage the inhabitants to go outside), Wright devoted almost as much floor space to the indoor rooms as to the outdoor balconies and terraces, which feature limestone for all their vertical surfaces and concrete for the horizontals. In keeping with his organic architecture philosophy, Wright incorporated a natural boulder at the entrance to the living room by the fireplace. Corner windows in the home broke up the rectangular shape of the building, surrounding the inhabitants with views of their natural environment. While Fallingwater is perhaps the most famous example of Wright’s work, a modest cottage located on a remote island near Sault Ste Marie, Ontario is the only Wright-designed building still standing in all of Canada. In September 1900, Chicago businessman Edward H. Pitkin bought an 18-acre parcel of land on Sapper Island to build a summer home for his family. To design and build the cottage, Pitkin commissioned his neighbour in Chicago, none other than Frank Lloyd Wright. The 1,400 sq. ft. E.H. Pitkin Cottage, still privately owned today, bears many of the hallmarks of the Wright stuff: harmony with its natural surroundings, a large overhanging roof, a horizontal profile, a unique second-floor deck in the same triangular shapes as the roof and a grand living room with a massive fireplace. Many cottages nearby imitated the look of this building. These kinds of descriptives annoy Toronto architect Graham Smith, whose firm, Altius Architecture Inc., specializes in modern single-family residential design and building. “People look at anything modern and, unless it’s white and chrome, they call it Frank Lloyd Wright by default,” Smith says, adding a concern about some residential developers associating their projects with the famous architect purely for marketing reasons, and often not delivering. “At Altius, we’re purists of modern architecture. Rather than emulating Wright, we subscribe to an ethos of thinking holistically about building. 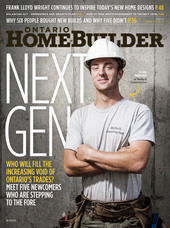 We create homes that are designed well—sustainable, liveable, contextual, economical and beautiful,” Smith says. Smith cites two primary influences on his company’s work: the introduction of “soft modern” Arts and Crafts workmanship at a time when modern design was trending towards “machine age”; and Frank Lloyd Wright’s Usonian idea of repetitive architecturally-designed homes for the masses. In addition to the firm’s impressive portfolio of large modern family homes, Altius also offers small and efficient Usonian-inspired pre-fab designs, named “Solo 40”, ranging from 480 to 2,000 square feet. One Ontario developer with a passion for Frank Lloyd Wright, Vandyk Group of Companies, has decided not only to embrace the Wright vibe, but also pledged to remain true to the philosophy of America’s greatest architect. 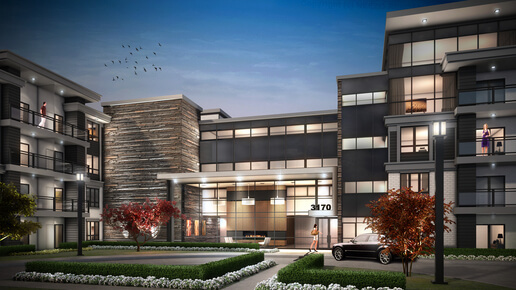 The Craftsman, a mid-rise condo community to be built on a 4.5-acre site on Lakeshore Rd. West in Mississauga’s Clarkson Village, hits all the Wright notes. A bird’s-eye view of The Craftsman, which features larger-than-average one- to three-bedroom suites, shows a unique configuration of three interconnected mid-rise buildings in the shape of a W, purposefully designed, according to Vandyk, to promote social engagement among residents. The buildings were also designed to work with the grade of the land, following the Frank Lloyd Wright philosophy of harmonizing with the natural habitat and not disturbing the environment. Landscaped courtyards with stone walkways, hedges and water features separate the buildings. Working with the project architects, Union 21 created a casual landscaped terrace with a pergola, fire pit and common seating areas to encourage relaxation and social interaction among residents. Located in Mississauga on Erin Mills Parkway, north of Dundas St. West, Windows on the Green is a luxury 4-storey condo with 150 suites and a penthouse loft collection. Currently under construction, only a few suites remain, with occupancy scheduled for late 2015. Today, more than 400 Wright creations still stand in North America, including the modest cottage in the northern woodlands of Ontario. Each building, whether residential or public, is an original work of art in its own right, designed to complement its environment and to comfortably accommodate and inspire its inhabitants. As exemplified by modern-day projects like The Craftsman, it is obvious that Wright’s influence endures to this day, and will likely do so for generations to come.